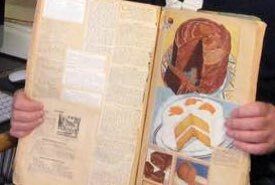 The out of print cookbooks referred to on this website are often still obtainable if you happen to know the secrets of where to look for them. They can offer an invaluable source of cookery information and pure reading enjoyment. Below, I share my helpful tips and secrets on how to find old editions and reprinted copies for your own cookbook collection. Some of the vintage cookbooks I inherited, but those I didn't inherit were mostly bought at local second hand bookstores specializing in out of print books. Sometimes, it's the dusty, disorganized shops that yield the best finds for rare editions. Be prepared to search through cardboard boxes and jam-packed shelves for something that catches your eye. Public library sales, garage sales, flea markets, and church bazaars are also good sources for vintage cookbooks. You can sometimes stumble across real bargains, but you must get there early before the serious book collectors. Ask your friends, relatives, and neighbors if they have any old, used cookbooks. Many people have them packed away in their basements or attics or taking up needed space on bookshelves, and they would be happy to give them a new home. Some of the more popular nineteenth-century cookery books can still be found in public libraries. They are often located off the main shelves in what they call the "stacks" because of their worn condition and susceptibility to damage. You may have to check the library computers and ask a librarian for assistance. Be sure to ask whether they have plans to include the book in a future library fundraising sale. Library sales are great sources for rare, vintage cookbooks. Used book stores that maintain a website can be great sources for used, rare, and out of print cookbooks. A search for an out of print book title on the Internet can sometimes locate an online store offering real bargains. A search for your favorite cookbook author's name will also turn up heritage cookbook sources. And don't forget to check out the "antiquarian" bookstores. 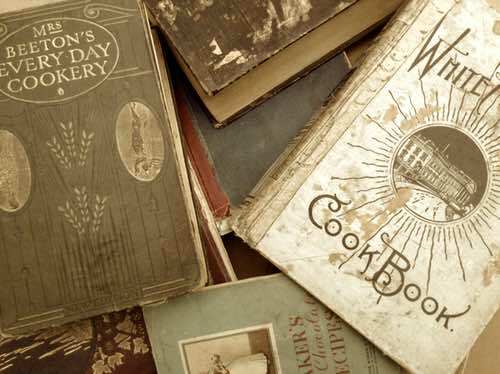 Prices for vintage cookbooks will often vary, but most old cookbooks from the eighteenth and nineteenth centuries are surprisingly low priced and affordable; however, a lot depends on the bookstore, the condition of the book, and its rarity. For instance, I purchased a well-used 1913 edition of "The White House Cook Book" for $15, and a 1912 edition of "Mrs. Beeton's Every Day Cookery" for just $8.00 at the local Peterborough Public Library fundraising sale. And, I was thrilled to get an 1891 edition of "The Girl’s Own Annual" in good condition for just $6 at a similar book sale. 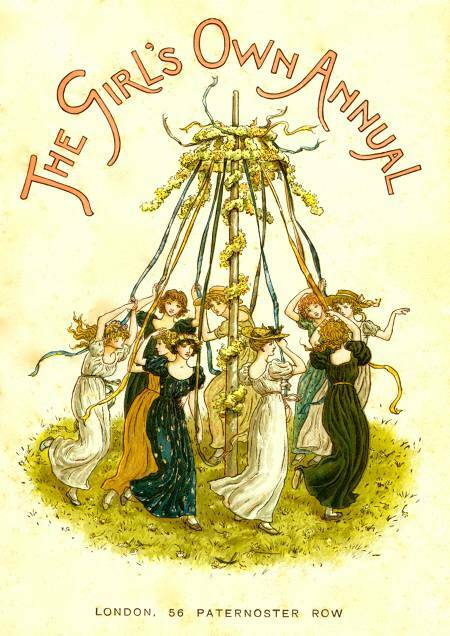 It contains some great Victorian dessert recipes, plus a delightful four-color frontispiece featuring a watercolor illustration by the celebrated nineteenth-century children's book illustrator Kate Greenaway (1846-1901). The Greenaway illustration alone (shown above), framed, is worth several times the price I paid for the book! You never know what treasures you will find at a used book sale. It's not unusual to find used Betty Crocker cookbooks as they were quite popular, but you might stumble across a vintage "Fannie Farmer Cook Book" or a copy of "Aunt Babette's Cook Book." These were some of the best recipe books of their day with great recipes for any occasion. My best advice: Have patience, keep searching, and you are sure to find some wonderful out of print cookbooks of interest. If you read the old fashioned dessert recipes on this website, you'll notice from the citations that many were discovered in vintage editions of "The Fannie Farmer Cookbook," "The White House Cookbook," "Mrs. Beeton's Everyday Cookery," and other classic recipe books that were famous in their day. Great news! You can sometimes buy reprints of these timeless cookbook classics at affordable prices online or in your local bookstore. Click the graphic below, search for the cookbook titles you want, and you should find them easily.